One of the best things in life, is the friendships we have. Those that we have only just begun and those that we have had for years - it doesn't matter, all the same. They keep us in check with who we are and have become and even when they let us down, we bounce back. Sometimes, even when there is distance, you can still pick up like you were never apart. I have a friend from HS who has arrived to the state for her sisters wedding. I will get to see her on Saturday, and though its been over a year since I saw her, and it was like 13 years before that, we always manage to pick up from where we left off. In leu of that occasion, I wanted to put together a little gift... 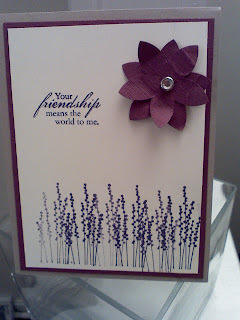 Here is my card for her. I am still trying to figure out what exactly to put together for her, since she lives in AZ now, with two kids, I am thinking I will come up with something, afterall, I have until Saturday to complete! 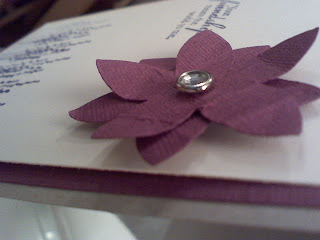 5 petal punch with textured paper, crumbled and pressed out, rhinestone in the center. Still one of my all time favorites - Pocket Silhouettes, they are so versatile! Why purple? .... we are suppose to dye my hair that color! I cannot wait! Thanks for looking! Have a fabulous day, but trry to stay cool, its going to be a scorcher here in PA!